Playing online poker can often be a little daunting. Joining a table of other players whether you’re in the real world or are utilizing online poker video streams can be a nervous experience. The pressure of being faced with other real opponents can often be too much, and you’ll find yourself nervous and making mistakes. Video poker is a great alternative to mainstream poker if you want to indulge in this popular card game without the stress of pulling a poker face and trying to compete against other players with vast experience. And, if you want to improve your chances of winning, there are ten top steps to take. This may sound obvious, but learning video poker thoroughly before you start putting in large wagers is the best way to improve your winnings. If you don’t know the game well, you could lose large bets on simple errors which you could have easily been avoided. So, it is essential to not throw yourself in the deep end, and first take a moment to understand the rules, regulations, and how video poker differs from table poker. Whilst video poker allows you to enjoy the popular game of poker there are, understandably, some important differences. 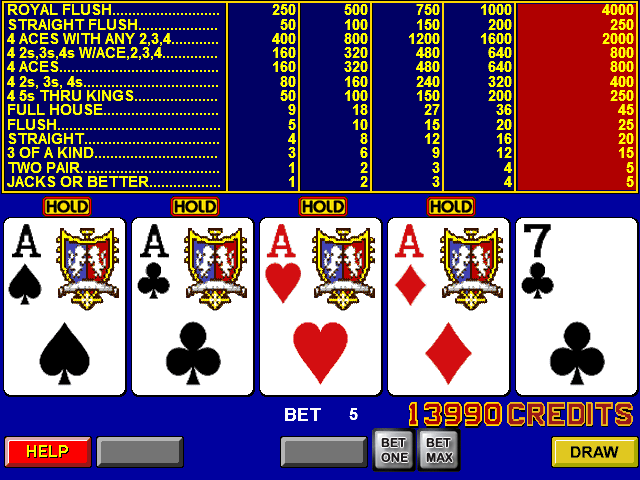 As a slot title, it has many aspects which are traditional to the slot game, including betting. You’ll normally find that you can wager between one and five credits, or simply opt for the max bet by pushing the appropriate button. After selecting your wager amount, the cards will be then dealt, with you able to have any discarded cards re-dealt for your final hand. Each casino which you play video poker at will have slightly different payouts for certain hands. It is important that you know these when you start to play, because it may help you make certain decisions in which cards to discard when opting for your final hand. There is also the chance to ‘double up’ if you win. In this case, both you and the video slot will pick a card. If you have the higher value, you’ll double your winnings for that particular hand, making your win all the more enjoyable.